Most veterinarians advise clients to brush their pet's teeth on a regular basis. Just like us, brushing our pet's teeth assist in breaking down plaque and tarter buildup. Bacteria can develop in the plaque and begin to cause damage, especially in the crevices between the teeth and gums. This can lead to an infection in the gum which may lead to abscessed teeth and gums, or even periodontal disease. Ideally, a kitten should receive a dental examination at 2-3 months of age and then again at 6-8 months of age. In other words, a cat/kitten should be seen once each year. If a problem occurs, prompt veterinarian treatment is a must. Gingivitis is an inflammation of the gums around the teeth caused by bacteria, plaque and tartar. Plaque is an invisible film on the tooth that is formed by bacteria in the mouth which live on bits of food that are left on and between the teeth when the cat eats. Tartar is a yellow/brown limestone-like deposit called calculus which adheres to the teeth. Tartar is formed when minerals in the cat's saliva combine with plaque and bacteria. The tartar irritates the gums and cause them to become red and inflamed (gingivitis). Plaque accumulates on the teeth while tartar is often along the gum line. Plaque Intolerance - Some cats may have an exaggerated oral immune response to plaque bacteria. Calicivirus infections in kittens cause small blisters on the tongue and gums which may contribute to extreme gingivitis. Bartonella infection (also known as "cat scratch fever") which is easily treated with an antibiotic. Immune System - If the cat has a poor or still developing immune system, plaque bacteria may be able to invade much further into the gums resulting in gingivitis. Gingivitis progresses very slowly and is easy to miss in the early stages. If neglected, the inflammation may slowly spread deeper into the gums, attacking the connective tissues that support the teeth. Your veterinarian (or a veterinarian who specializes in animal dentistry) should be contacted for a dental exam if any of the above, symptoms are present. Gingivitis can develop in young cats ("juvenile onset" gingivitis) and occurs at about 3-5 months as the permanent teeth are coming in and becomes more severe by 9 months of age. At about 2 years of age (when the immune system is fully developed), the juvenile gingivitis goes away. In cases of juvenile onset gingivitis, professional teeth cleaning every 2 months and once-to twice-daily brushing at home for the first year or so of their life, is highly recommended. As cats age, changes in the saliva and mouth chemistry occur which often causes an increase in the rate of tartar buildup in older cats. There is some evidence that certain breeds, like the Siamese are more prone to gingivitis, while other professionals feel it is more common in domestic shorthair cats. Persians and Exotics may be more prone to problems as their mouths are more compact than longer nosed cats and the teeth become crowded, providing prime conditions for bacteria and plaque buildup. All cats regardless of breed are more susceptible as they reach their senior years. Early Gingivitis - Reducing the amount of plaque, tartar and bacteria is the goal to treating early gingivitis by following the above suggestions. Gingivitis Due to Plaque Intolerance - Gingivitis can be controlled by reducing plaque on teeth by using a canned diet that reduces plaque or by reducing bacteria by using antibiotics where the immune system is hypersensitive to bacteria. Removing tartar from the teeth. Brushing and the application of 0.2% chlorhexidine. Extracting any teeth with lesions or severe periodontal disease. Antibiotics – Clindamycin, metronidazole, or tetracycline are good choices. Corticosteroids: methylprednisolone acetate (Depo Medrol). Good nutrition, often with vitamin supplements since these cats may not eat as much as they should because of the discomfort. In extreme cases of periodontal disease all the teeth behind the "fangs" may need to be removed. 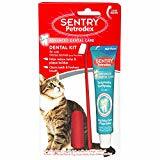 As gingivitis can lead to more serious dental diseases (such as periodontitis and stomatitis which in turn can result in tooth loss and decay), it is important not to ignore early signs of a dental problem in your cat. Daily Brushing of the cat's teeth helps keep the tartar away. Non-foaming toothpaste that is flavored for cats is available. Finger brushes or small tooth brushes suitable for a cat are also available. Chews CET makes pet toothpaste and a soft enzymatic chew. Pet Mouthwash or a spray designed to reduce bacteria in the mouth can be applied at home. Regular Dental Exams should be part of your cat's annual or semi-annual checkups. Professional Cleaning when necessary. Cleaning should always be done under anesthesia. Vitamin C Supplement is believed to reduce plaque formation. You should brush its teeth starting when it is a kitten. Kittens begin to get their baby (or temporary teeth) at about 2-3 weeks of age. Permanent teeth usually begin to come in at about 3 - 4 months of age, and the adult teeth should be in by about eight months of age. Brushing your cat's teeth is not that difficult and just like trimming your cat's claws, it is something both you and your cat can become accustomed to with practice. 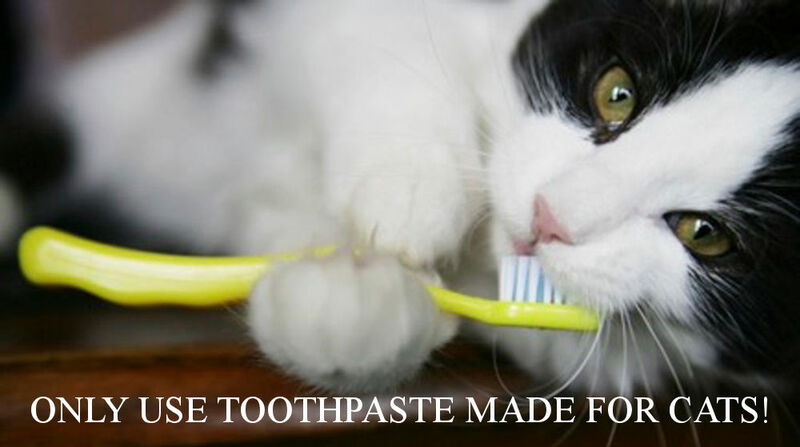 Veterinary Toothpaste - is available in specially formulated flavors for cats. Do not use human toothpaste or baking soda! Finger Toothbrush - A rubber, bristled brush fitting over your finger makes it easy to manipulate in mouth of the cat. Cat Toothbrush (optional) - A soft-bristled tooth brush (similar to a human baby toothbrush), usually has a slightly angled head that allows for better entry into the cat's mouth. A bristled tooth brush is better for reaching below the gum line – an important area to brush. Periodontal disease usually affects the upper, back teeth more commonly and more severely. Plaque builds up on the tooth surface, especially just under the gum line. It takes less than 36 hours for this plaque to become mineralized and harden into "tartar" (calculus) that cannot easily be removed with a brush. Therefore, daily brushing is recommended to remove the plaque from under the gum line. Work from back to front, making small circles along the gum line. It should take you less than 30 seconds to brush your pet's teeth. Do not try to brush the entire mouth at first. If all that your cat lets you brush is the outside of the upper teeth, you are still addressing the most important area of periodontal disease – prevention. It may take several days for your cat to become used to having its teeth brushed. Follow the procedure with praise and a treat after each session. Even with the best tooth brushing, some cats may still need an occasional professional dental cleaning by our veterinarian. By brushing your cat's teeth daily and curtailing the amount of periodontal disease, you may reduce the frequency and involvement of dental cleanings and provide your cat with a healthier, sweeter smile. PLEASE NOTE: Never use human toothpaste as it may foam, causing stomach upset or vomiting.